It's the guidebook you don't want to be without. Hunters, hikers, campers, mountain climbers and even those out in the wilderness in combat, 5ive Star Gear's Survival Manual is the must-have book for you! 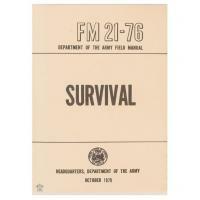 The comprehensive manual offers a detailed walkthrough of any and all eventuality a true survivalist may encounter and should be ready to tackle if stranded outdoors. The manual covers all climates and terrains that adventure-seekers may find themselves in and provides detailed instructions, as well as illustrations to deliver the best possible advice in a life or death scenario.